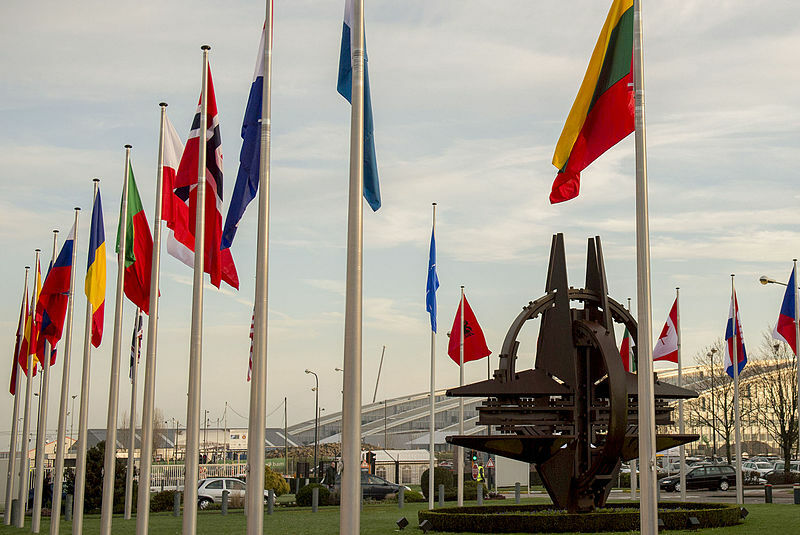 Currently, NATO has 29 members in North America and Europe - Albania, Belgium, Bulgaria, Canada, Croatia, the Czech Republic, Denmark, Estonia, France, Germany, Greece, Hungary, Iceland, Italy, Latvia, Lithuania, Luxembourg, Montenegro, the Netherlands, Norway, Poland, Portugal, Romania, Slovakia, Slovenia, Spain, Turkey, the United Kingdom and the United States. Although SHAPE has retained its traditional name referring to Europe, it controls all NATO operations worldwide - the geographical scope of its activities having been extended in 2003. Similarly, the commander of ACO also retains the title "Supreme Allied Commander Europe" (SACEUR), and continues to be a U.S. four-star general who is also Commander, U.S. European Command. After the fall of the Berlin Wall in 1989, NATO became involved in the breakup of Yugoslavia – with the first military interventions in Bosnia 1992 - 1995 and later Yugoslavia in 1999. Membership of the alliance has not always been popular - some Icelanders participated in a pro-neutrality, anti-membership riot in Reykjavik on 30 March 1949 following the decision of the Icelandic parliament to join. Provision for NATO enlargement is given by Article 10 of the North Atlantic Treaty which states that membership is open to any “European State in a position to further the principles of this Treaty and to contribute to the security of the North Atlantic area”. Any decision to invite a country to join the Alliance is taken by the North Atlantic Council, NATO’s principal political decision-making body. Only European states are eligible for new membership and approval is needed from all the existing member states. Ina ddition, every member state can put forward specific conditions that would need to be met. For example, Greece is blocking membership of the Republic of Macedonia's due to a disagreement over the use of the name Macedonia. Similarly, Turkey opposes the participation of the Republic of Cyprus with NATO institutions until the dispute over Cyprus dispute is resolved. The North-Atlantic Treaty does not specify how decisions have to be made - except for under Article 10 where unanimous agreement is needed when inviting new members.Therefore, NATO relies on the customary practices it has developed over time. Article 5 of the North Atlantic treaty, which requires member states to come to the aid of any member state subject to an armed attack, has only been invoked once – following the attacks in the U.S. on September 11, 2001. NATO led the International Security Assistance Force (ISAF) which was established by the UN Security Council and which deployed troops to Afghanistan. Since then the organization has operated a number of additional roles, including sending a training mission to Iraq (2004-2011); providing assistance in counter-piracy operations through “Operation Ocean Shield” (2009-2016 - NATO's contribution to “Operation Enduring Freedom – Horn of Africa”) and enforcing a no-fly zone over Libya (2011). The 2016 NATO Summit in Warsaw agreed to recognise cyberspace as “an operational domain, alongside air, land and sea”. Thus, cyber-attacks against NATO countries can potentially trigger an Article 5 military response (an attack on one country is an attack on all) - increasing the possibility of NATO taking collective military action. However, determining the source of cyber-attacks is not so easy and technical evidence of them is rarely shared or clarified. Article 4 – which calls for consultation among members - has been invoked 4 times by Turkey: once in 2003 over the Second Iraq War; twice in 2012 over the Syrian civil war and in 2015 following threats from Islamic State. Russia has asked to join NATO several times. In 1954 the Kremlin asked to join NATO but was rejected - possibly leading to the formation of the Warsaw Pact (“Soviets tried to join Nato in 1954” and “Molotov's Proposal that the USSR Join NATO”). A secret document revealed by Vladimir Putin in 2001 that the response from the West was that “the unrealistic nature of the proposal does not warrant discussion”. In 2000 President Vladimir Putin also asked to join (“Putin's Labyrinth”) and asked again in 2003. He wanted to join as one of the first-tier members like Britain, France, and Germany, and not as one of the new Eastern European countries - but it never happened. NATO has also been working with the African Union (AU) since 2005, when it provided support to the AU mission in Darfur, Sudan – the first NATO mission on the African continent. Currently NATO is supporting the AU Mission in Somalia and a long-term peacekeeping capability - the African Standby Force. Four AU members (Algeria, Egypt, Mauritania and Tunisia) along with Morocco, are already in a NATO partnership program: the Mediterranean Dialogue - one of the two formal mechanisms for NATO interaction with countries in the Middle East and North Africa. The other is the Istanbul Cooperation Initiative. However, NATO officials and partner countries agree that neither initiative has been a great success. In the name of interoperability, NATO has also brought about a standardisation of allied military terminology, procedures, and technology - which basically means adopting U.S. practices. Over 1300 Standardisation Agreements exist and new countries are forced to become integrated and buy U.S. equipment. The US also confirmed agreements to base 24 Aegis Ashore interceptors at the Redzikowo military base in Poland by 2018 and the hosting of US Aegis missile defense ships in Rota, southern Spain. In addition, the Netherlands decided to adapt 4 air-defence frigates for NATO’s Ballistic Missile Defense (BMD) capability. From 2018 all four Royal Netherlands Navy Air Defense and Command Frigates (ADCF) will be fitted with SMART-L radars to enable them to detect and track ballistic targets outside the earth's atmosphere for other NATO missile defense components. War fighting is not just about tanks. Today the military depends on space power. Military commanders and decision makers require information and control – information about targets, troop movements, the weather, etc. and control of the movement of military components, ships, tanks, personnel, drones, etc. and today military operations are informed by and controlled through satellite systems that provide space power - technologies for surveillance, communication, global positioning, targeting, guidance and remote drone operations. The western governments and media continue to claim that the increase in US and NATO military activities and the establishment of bases along eastern European and Scandinavian borders is “in response to Russia’s actions in Ukraine and Kaliningrad". However, Russia sees NATO and the US pushing military bases and escalating aggressive military exercises ever closer to its borders – despite past promises that it would not go there. A framework agreement for NATO-UN cooperation was proposed by NATO Secretary General de Hoop Scheffer in September 2005. Previously, the UN Secretary General‘s High-level panel on threats, challenges and change (HLP) explicitly referred to NATO - UN cooperation. Its December 2004 report stated, that “[i]n the case of NATO, there may also be a constructive role for it to play in assisting in the training and equipping of less well resourced regional organizations and States.” However, in its follow-up report, “In larger Freedom” UN Secretary General Kofi Annan also highlighted the importance of formal cooperation with regional organisations without particular mention of NATO.